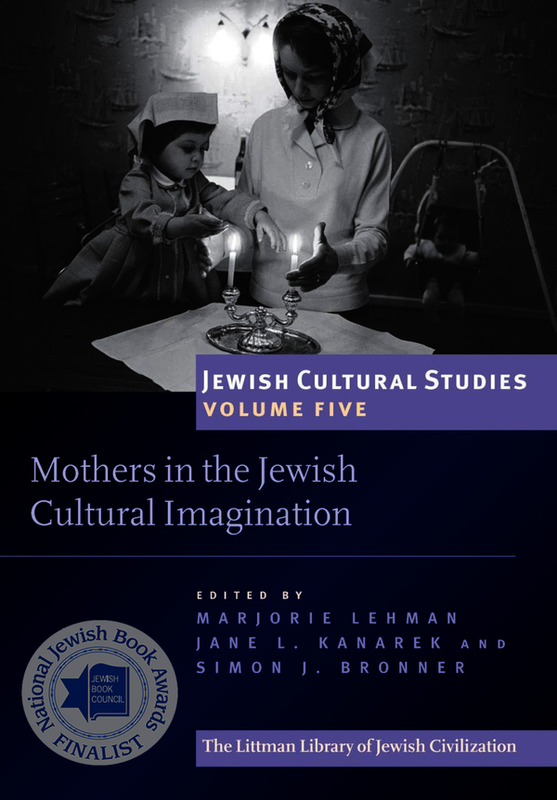 Mothers in the Jewish Cultural Imagination, edited by Marjorie Lehman, Jane L. Kanarek, and Simon J. Bronner, Oxford University Press: New York, 2017. The popular image of the “Jewish mother” is loud, overbearing, and constantly urging food upon family and strangers alike. But in fact, this image is a recent innovation of twentieth-century American Judaism. What other images of mothers exist in the Jewish cultural imagination? And, what do those images reveal about wider ideas of gender and family in Jewish culture? These are the questions that editors Marjorie Lehman, Jane L. Kanarek, and Simon J. Bronner seek to answer in their new collected volume, Mothers in the Jewish Cultural Imagination (2017), part of the series Jewish Cultural Studies. The aim of this book is to complicate the stereotypical, one-dimensional view of the Jewish mother that has been so prevalent in our collective imagination. The editors wish to emphasize the “variety of identities held by mothers as well as the vast array of cultural and social patterns that characterizations of mothers reflect” (p. 8). Conversely, they use a comparative approach to “emphasize cultural patterns and the specific ways in which they manifest themselves in a variety of contexts” (p. 8). Their work sits at the intersection of Jewish studies, women’s history, and motherhood studies—all impressive fields in their own right, though the overlap between all three is of relatively modest size. It is accompanied by texts such as Joyce Antler’s You Never Call, You Never Write! A History of the Jewish Mother (2007), upon which Lehman, Kanarek, and Bronner seek to build their analyses of how mothers become “vessel[s] into which cultural contradictions of a society grappling with ethnic, gender, class, and racial tensions could be poured” (2007:7-9). While Antler focused on twentieth-century American Jewish mothers, Mothers in the Jewish Cultural Imagination explores how mothers functioned similarly as such “vessels” in other times and places. To that end, the book is divided into five sections, organized thematically, rather than chronologically. It seeks to seeks to bring together analyses of Jewish motherhood that span a wide temporal, spatial, and topical range. The first section, “Idealized Mothers,” features four essays which explore how discourse from the contemporary United States, late nineteenth-century Hungary, modern Afghanistan, and the sixteenth century Ottoman empire attempt to construct hegemonic motherhood. The four essays in the second section, “Constructions and Contestations of Mothers,” feature texts which complicate this idealized, monolithic portrayal of the Jewish mother; one such example is the work of Maurice Sendak, who Jodi Eichler-Levine argues “becomes a Jewish mother himself” in the process of writing (p. 149). The third section of this volume, “Activist Mothers,” features mothers who critiqued and transformed the societies in which they lived: warrior women in late antique and rabbinic literature, American Jewish mothers in the late nineteenth/early twentieth centuries, biblical mothers in the Zohar, and modern Israeli poet-mothers. All three of the essays in part four, “Embodying Mothers,” address the physical, laborious reality of motherhood (pregnancy, childbirth, breastfeeding, and childrearing), an important category in the field of Jewish studies despite long being ignored by the scholarly community. The fifth, final, and briefest section, “Recasting Mothers,” contains two essays which rethink motherhood in Sefer Hama’asim and other rabbinic texts. For the purposes of review in this journal, the essays on ancient Judaism merit special attention. These four essays provide a window into the diverse approaches of the contributing authors, and to the diverse ways motherhood is conceived in the Jewish imagination. In “Like Mother Like Daughter: Mother-Daughter Relations in Babylonian Talmudic Stories,” Moshe Lavee uses a literary analysis to consider two narratives from Bava Metsia and Ketubot in the Babylonian Talmud, in which mother-daughter relationships play small but important roles. Lavee argues that these mother-daughter appearances play a “crucial role” in “preserving the desired patriarchal social structure” of both the family and the beit midrash (p. 123). The mother-daughter pair is an understudied aspect of family life in Jewish history, in which the father-son pair (and sometimes the husband-wife pair) is the more obvious and developed in literary sources. Yet as Lavee points out, the figures of mothers and daughters perform an important literary function by “[bridging] the ascetic sphere…with these more normative social realms of religious experience” and simultaneously “[offering] a critique of the rabbinic social model” (p. 123). These women are, of course, written from a male perspective in order to serve male interests, and it is worth considering the harm done to real mothers and daughters when men use them to “think with” in this way. Caryn Tamber-Rosenau’s “The ‘Mothers’ Who Were Not: Motherhood Imagery and Childless Women Warriors in Early Jewish Literature,” is also highly relevant to the study of ancient Judaism. In this essay, Tamber-Rosenau uses queer theory to explore how late antique and rabbinic writing uses maternal imagery to construct Deborah and Jael, and how the author of the book of Judith (itself an extracanonical work inspired by Jael) does the same. This is an extremely promising area of research. Most of the women in the Hebrew Bible are mothers, but a unique few have roles such as warriors, as Tamber-Rosenau explicates, or prophets. It is worth investigating how later traditions handled those women who transgressed the biblical framework of family and motherhood. What does it mean to make a non-mother a mother? Does it take away from her power? Does it reflect an insistence that all women must fit inside a patriarchal framework? Or conversely, does it bestow greater esteem on mothers to be associated with women warriors and prophets? As Tamber-Rosenau argues, Deborah, Jael, and Judith, at least, “appropriate the power of motherhood” and “parody the expectation that women should be mothers” (p. 202)-- to my ears, in a way reminiscent of Homi Bhabha’s concept of mimicry. Tamber-Rosenau’s probing questions are worth asking of other “maternalized” figures in postbiblical literature. In “Upending the Curse of Eve: A Reframing of Maternal Breastfeeding in BT Ketubot,” Miriam Simma-Walfish unpacks rabbinic recommendations about breastfeeding through the lens of women’s bodily autonomy. She traces the development of laws about breastfeeding in BT Ketubot 59b-61a, which preserves two traditions about breastfeeding: one which views it as an obligation of a wife to her husband, and one which views it as an obligation of a mother to her child. She focuses on the anonymous editorial voice’s concern for the mother’s pain, which acts as the decisive factor in three legal rulings about breastfeeding. Ultimately, she argues, “this transforms [the mother] from an object to a subject and an agent whose experiences carry significance and weight” (p. 309). These tensions about women’s bodies, and who “owns” them, resonate not only in the late antique world of the rabbis, but in the present. The debates among mothers and society at large about breastfeeding versus formula feeding, staying home versus working outside the home, even medicated versus unmedicated childbirth, carry significant personal and political weight for contemporary women and have potential implications for women’s sense of self. It is illuminating to discover that these conversations are not new and have, in fact, been occurring for millennia. Finally, Deena Aranoff uses a linguistic approach to argue that the meaning of the term ̉mn, which primarily connotes “faithfulness” in biblical and postbiblical literature (and is the root of the word “Amen”), has its roots in the idea of caring for or rearing children (its secondary meaning). She argues that the very idea of faithfulness and steadfastness developed from the constant provision characteristic of a mother’s caregiving. Viewing the term with this extra valence enriches our understanding of places where it is used in apparently non-maternal settings in the Hebrew Bible, for example, in Prov. 8:30: “And I [Wisdom] was near him [God], growing up [amon], And I was his delight day after day, Playing before him at all times” (Aranoff’s translation). The metaphorical meaning of ̉mn is much more frequently found in the biblical books than is the concrete meaning. Aranoff attributes this to the “marginalization of the mother” in “elite forms of literary expression” (p. 338), and I suspect she is right; her conclusions align with those of Tikva Frymer-Kensky in The Wake of the Goddesses: Women, Culture, and the Biblical Transformation of Pagan Myth (1992): that the goddess religion of ancient Israel was similarly marginalized in monotheistic, male-dominated biblical religion. One must work very hard to find the last remaining hints of both mothers in ̉mn and goddesses in the biblical text, but the results are very much worth it. This book provides a welcome addition to the fields of Jewish studies, women’s history, and motherhood studies. Several essays, such as those I have highlighted above, have particular relevance for the study of Judaism in late antiquity. This volume succeeds admirably in its goal of demonstrating that motherhood, rather than being innate in women’s very biological makeup, is an unstable identity. While the essays span a wide array of historical contexts, the common theme that runs through them is how cultural discourse constructs motherhood to reflect the values and anxieties of that particular moment. While no collected volume can represent the full spread of a given topic, I believe the collection would only be enriched by going “wider,” for example, through the addition of essays that had a starting point other than text (such as visual art or archaeology). At the same time, each of these essays also left me wanting to go deeper—contemporary Jewish mothers in Afghanistan, biblical mothers in the Zohar, and mother-daughter relationships in the Talmud (to name but a few) are all deserving of their own monographs. It is my sincerest hope that Mothers in the Jewish Cultural Imagination marks but a starting point to the field of Jewish motherhood studies, a field that is rich with untapped potential. Antler, Joyce. You Never Call, You Never Write! A History of the Jewish Mother. New York: Oxford University Press, 2007. Frymer-Kensky, Tikva. In The Wake of the Goddesses: Women, Culture, and the Biblical Transformation of Pagan Myth. New York: The Free Press, 1992. Sari Fein is a PhD Candidate in the department of Near Eastern and Judaic Studies at Brandeis University. See Homi Bhabha, The Location of Culture (London: Routledge, 1994).